The two with their heads hidden. There was quite the mix of birds with these two. Can't figure out what they are. Sorry the best I have of them is attached. 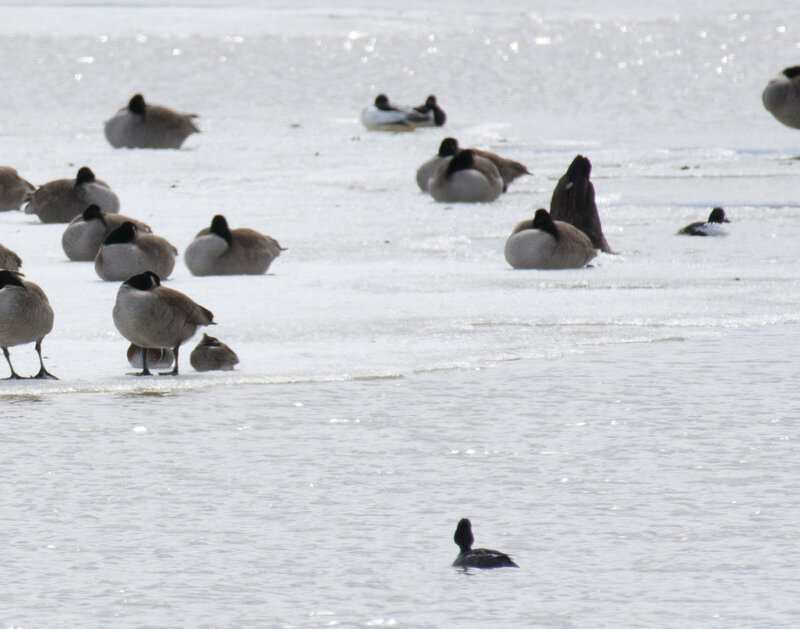 There was Ring-billed Ducks, Common and Hooded Mergansers, Wood Ducks, Mallards, American Black Ducks ad Common Goldeneyes in the same place. Is it one of these or something different? Can't figure out who they are. Thank you. 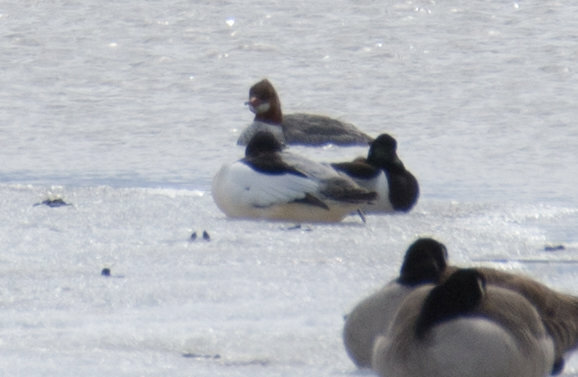 I'd say male Common Merganser on the left and male Ring-necked Duck on the right. 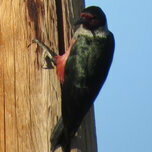 I can't speak to the left-hand bird but I second Ring-Necked on the right. Agree and the female Common behind. I'm not so sure these two are water ducks. They appear to be sitting on land. Nope, definitely water, but frozen. That's not a wave crest running from left to right near the top of the second photo? I've been told this can only happen in Canada and is impossible in Texas. Yep everything still ice. Northern Ontario. Just a channel of open water on a lake. Yes, there are special freezers in Canada for when they want enough ice cubes for a lake instead of just a Coke. I'd like to claim only academic knowledge of this phenomenon, but three winters in the Upper Peninsula demonstrated that not only is it possible, sometimes it's the default.